"The best thing is that you're not obliged to follow any laws or rules. You feel like you are the law. You are the law. You decide. It's as if the moment you leave Israel and pass through the Erez Checkpoint into the Gaza Strip, you are the law. You are God." - comment by one of the IDF soldiers interviewed by Israeli psychologist Nofer Ishai-Karen. Cited by Dalia Karpel in an article entitled The Person Who Gets People To Talk/המדובבת which was published in Ha'aretz's Hebrew edition on 21 Sept 2007, but did not appear in the English edition. (Translation mine). 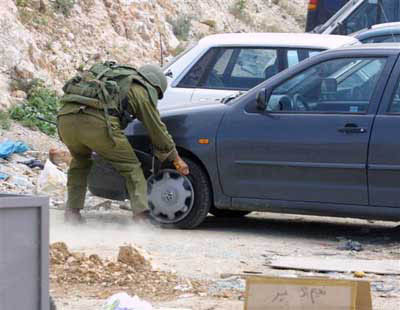 The photo - An Israeli soldier slashes the tires on Palestinian private cars on 11 Jan 2003, following the new closure imposed on the Occupied Territories - is via CSCAweb.